Note: When configuring TLS settings in the cloud, if an update to sites/default/settings.php is required, to avoid Git conflicts Apigee recommends that you edit sites/default/settings.local.php instead of editing sites/default/settings.php directly. 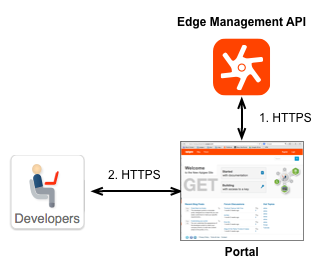 Note: Apigee recommends that you configure the Private Cloud version of the Edge management API to use TLS, unless you have deployed both Edge and the portal behind a firewall with no public access. 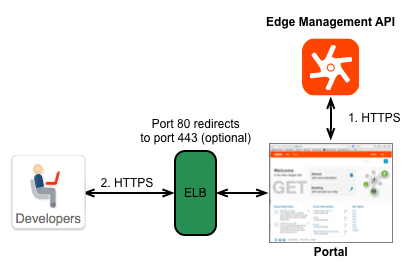 For information on configuring Edge to use TLS, see Configuring TLS/SSL for Edge On Premises. Pantheon provides free automated HTTPS for all sites on its platform through the Pantheon Global CDN and using Let's Encrypt. See also HTTPS on Pantheon's Global CDN. Note: For customers using Pantheon's legacy HTTPS support, to upgrade see Enabling the Global CDN and the FAQ. Configure TLS on the portal itself: If necessary, you can configure TLS on the web server that hosts the portal. See Configuring the portal to use HTTPS for more information. Note: The following assumes your load balancer is configured to include the X-Forwarded-Proto HTTP header. // Assume we can't detect SSL unless proven otherwise. // You could optionally substitute a canonical server name for $_SERVER['HTTP_HOST'] here. Note: All Canonical Name records (CNAMEs) in your DNS must have corresponding certificates. For *.devportal.apigee.io, a default certificate is provided.